Sister Ann Casper with Harve Schlachter. Harve is no stranger to the Sisters of Providence or to development’s focus of friend raising and fundraising. Harve has been coming to the Woods from Chicago for several years to visit a friend, Sister Agnes Maureen Badura, so he already knows several sisters. He long ago adopted alpacas for his two grandchildren and will soon adopt a third for a newborn. His wife and the parents of the grandkids have all been to the Woods. Each visit also results in his taking home to Chicago his standard order for several dozen eggs from the Farm Store at White Violet Center. Harve was formerly director of planned giving at the University of Saint Mary of the Lake in Mundelein, Ill., for six years. He has been dedicated throughout his career to building relationships, including 22 years with American Airlines, working in the domestic and international arenas in client relations and a myriad of other partnerships. I have teased Harve that his transition from “the Lake” to “the Woods” holds rich symbolism. All is clear when on a lake; in the woods, not so much! I’ve never experienced anyone “shadowing” me for a month! I learned quickly that I cannot expect to talk about this role for 23, 8-hour work days! Yes, I’ve done a fair share of talking, but we’ve also met and greeted many SP staff members, from directors and volunteers, to office staff and food service workers. We’ve also met some staff at Providence Health Care and Saint Mary-of-the-Woods College. And we’ve spent time “touring the grounds.” Harve has seen places the normal visitor does not see, like the massive facilities store room with everything from screws to cans of paint, all sorted and categorized. He’s been inside the SP Corbe House residence, built in 1888. I took him to the water treatment plant and to the garage. Didn’t make it to the boiler/electrical rooms, but I’ve got a few days yet in August, so who knows? And I’ve also learned a few things about Harve. He and his wife, Stephany, have the practice of gathering their children and families every week for mid-afternoon Sunday dinners. He’s a great fan of bargains at Costco and has the motto that “sharing is caring,” so the MA and the Administration Building staffs find goodies popping up now and then. And, we immediately converted him to Terre Haute’s world-famous Square Donuts and he has already treated us to several dozen! Hearty welcome to you Harve! 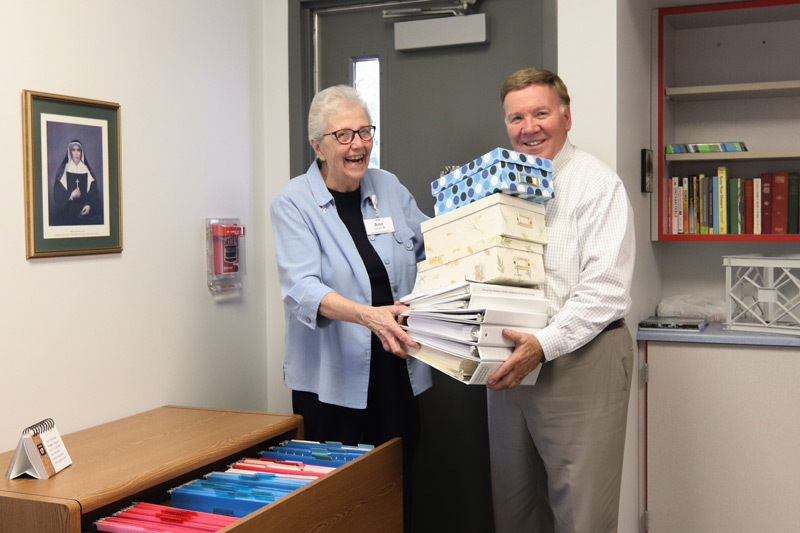 Sister Ann Casper, SP, recently retired as the executive director for Mission Advancement for the Sisters of Providence and is currently serves in volunteer ministry in the mother house in Saint Mary-of-the-Woods, Ind. Sister Ann has ministered in various scholastic and administrative positions in Indiana and North Carolina. She also was a member of the General Council, serving as General Secretary. ← It’s school reunion time! Welcome Harv! We’re glad you’re here. You have big shoes to fill but you already know that. Welcome to you, Harve. Best wishes to you as you begin a new ministry. And thanks for your service, Ann for all these years. God bless you both!